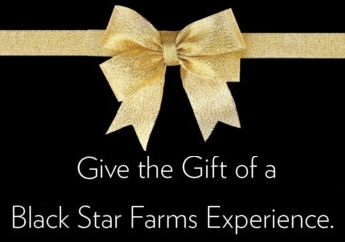 A gift certificate to Black Star Farms is a beautiful gift, with many possibilities! The recipient can utilize the certificate at any of our three Grand Traverse Region tasting rooms for any products. Additionally, the certificate may be used anywhere on our Suttons Bay property-its just that versatile! At our Suttons Bay location, the gift can be used towards a stay at the Inn at Black Star Farms, a monthly Harvest Dinner that celebrates the local harvest of the season, cooking classes with our Executive Chef, lunch or dinner at Hearth & Vine Cafe, or toward special packages in the Inn. It truly is a gift to delight!